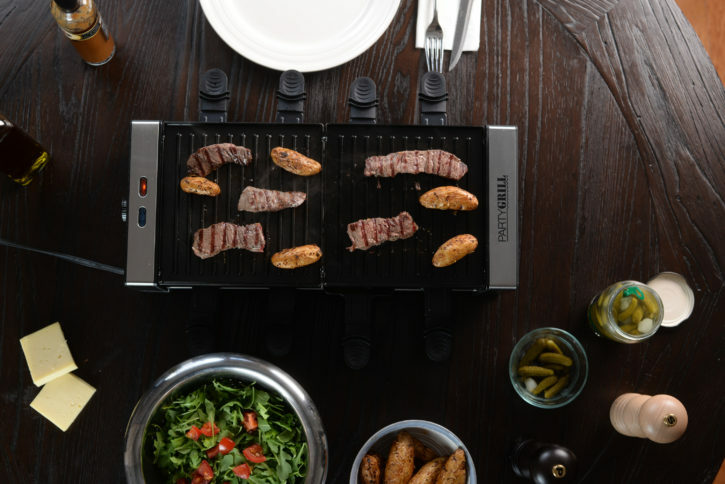 PARTY GRILL is an amazing tabletop grill that has become very trendy as the center-piece at creative dinner parties. This appliance has a grill on top and trays with handles sticking out underneath. 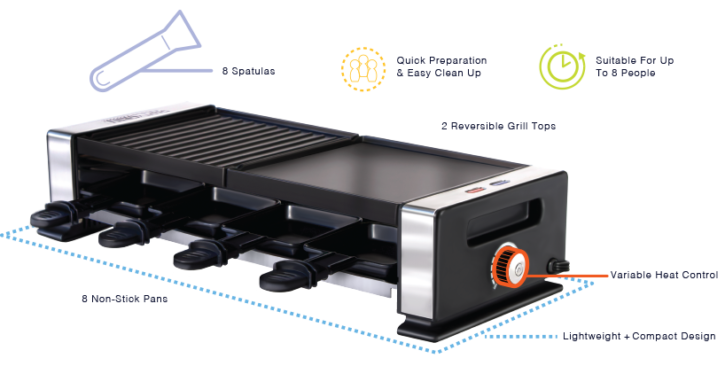 PartyGrill is a versatile indoor electric grill that gives you the ability to easily grill meat, veggies and most importantly: melts your favorite cheeses. 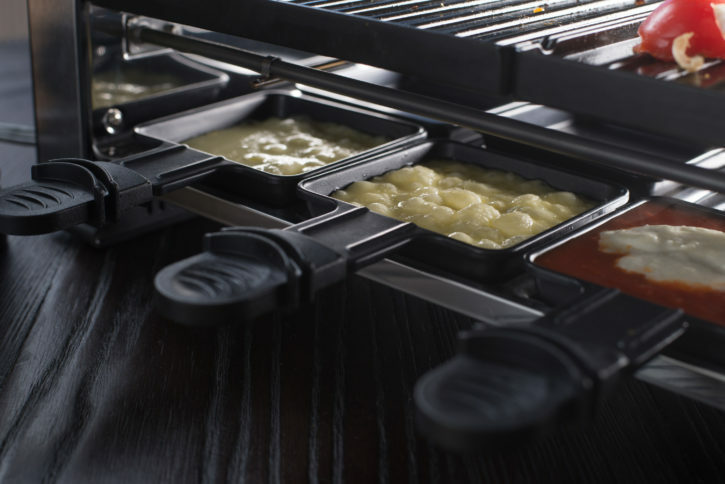 A tradition from Switzerland, raclette dinners provide an interactive culinary experience for the whole family and friends: instead of cooking for your guests, cook with them! Since guests serve themselves and cook their own bites to their liking, it’s finally a dinner party where the host can relax and enjoy the meal with everyone at the table! 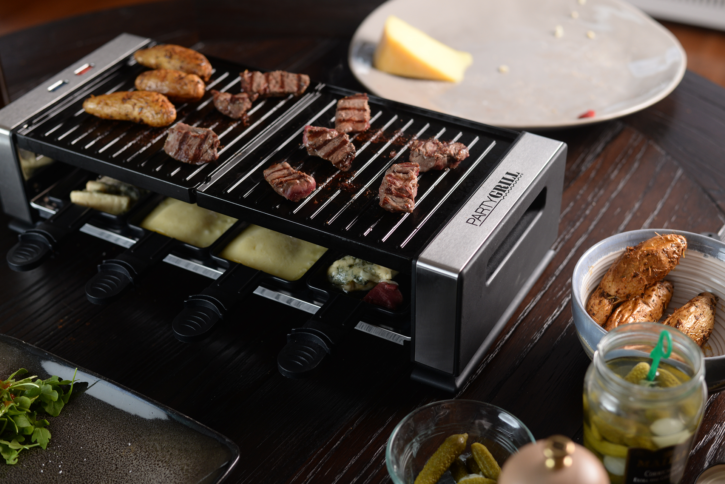 With the aluminum grill plate and 8 raclette trays with handles sticking out underneath, the possibilities are endless! You can grill the veggies and meats while melting cheese and heating potatoes in the lower portion! This easy to use grill is sure to make your next party a sensation. Beef, chicken, lamb, shrimp – grill anything! Yes, you can also veggies. Asparagus, onions, peppers, scallions, mushrooms, tomatoes, and more! Cut meat and veggies into slices, bite size is preferable. Depending on the thickness, grill for approximately 2-4 minutes, flipping sides as needed. For larger pieces of meat or bigger cuts of vegetables, grill for longer periods of time – until it is cooked to your liking. For potatoes, boil separately. 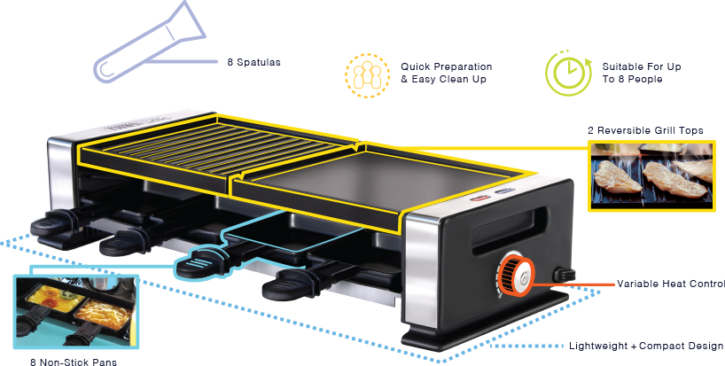 If you are looking to melt cheese, the Party Grill is the tool for you! 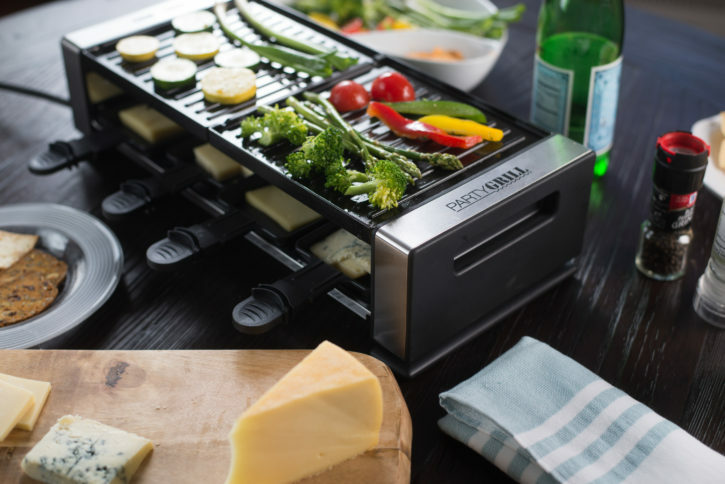 Try an assortment of different cheeses, using your broil trays to achieve the right level of meltiness. Experiment with different cheeses, such as: Gruyere, Cheddar, Blue Cheese, Raclette, Brie, Colby, Monterey Jack and more! When using cheese, slice it to fit the size of the broil tray, or use the large side of your cheese shredder. When melting cheese, you will get the best results using cheese with a high fat content. What are the grill top parts made of? The grill tops are made of cast aluminum and they are covered with a non stick coating, to make sure your meat & veggies won’t stick to the grill while cooking. Turn on your heat-dial-button on to FULL and let the PartyGrill heat for 8-10 minutes. Once it’s all nice and hot your grill is ready to be used! Cooking time varies based on the ingredients you place on it, as well as the way you like your meat cooked. How many people can use the PartyGrill at once? PartyGrill can provide entertainment for six to eight people at the same time! However, if you want to get the most out of your PartyGrill we recommend having a dinner party of four. If you know you’re going to be hosting larger parties, there is a simple solution… Two PartyGrills will make the party even better! If you have more questions click here for the full FAQ or here to download the User Manual. It’s for 8 people and has eight pans, but the most I’ve used with this grill were four people. It would work for eight and I could see using this for two people. easy to clean. The pans are non-stick coated and were easy to clean even of dried cheese. 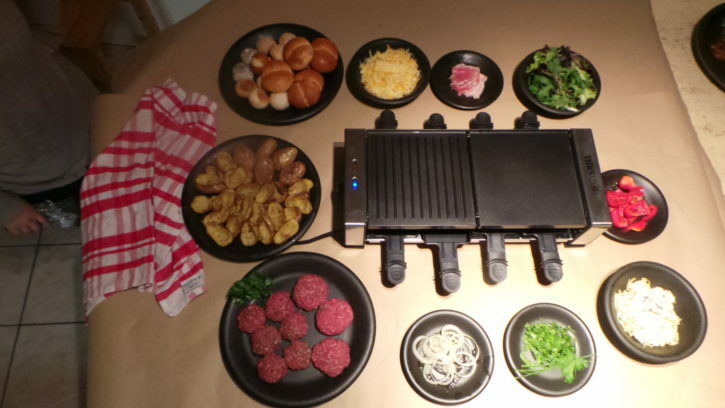 Many raclette grills can go upward of hundreds of dollars so this one is a good choice, especially if you’re just starting out or only using it a few times a year. Overall I’m very happy with this grill. It works well and the raclette was fun and tasty. 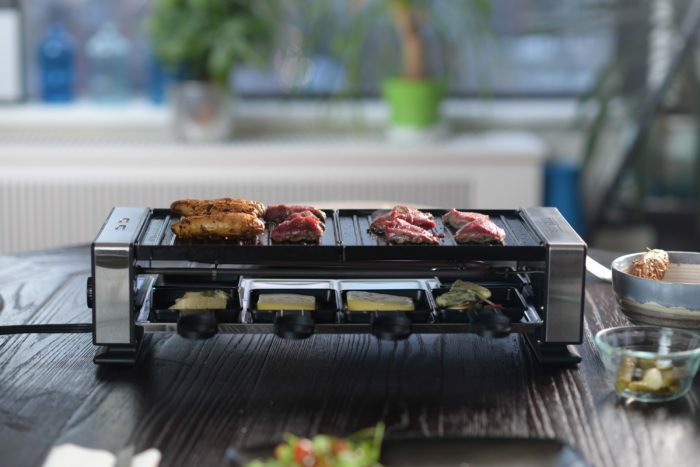 Highly recommended purchase for whoever wants to do a raclette for 6 and not spend too much money. For an unknown reason raclette appliances are too expensive in the USA so do not hesitate to buy this one for once there is one which is affordable and works pretty well. Raclette is something pleasant to do especially after the ski in winter when you and your tribe are hungry and want to have fun around a table with a minimum of preparation. It is really convivial and so easy. Originally it comes from Switzerland (probably from the Middle Age) and spread to Savoie in France and many other places in the Alps. There are many variations of this dish, but it used to be potatoes with a layer of melted cheese accompanied with a glass of “Fendant” (A Chasselas white wine from Valais in Switzerland). However, marketing or not, many people I know drink Roussette de Savoie when having a raclette. For the cheese you can buy raclette cheese directly on Amazon or elsewhere and freeze it. Take the cheese out the day before you do your raclette and let it unfreeze in your fridge. 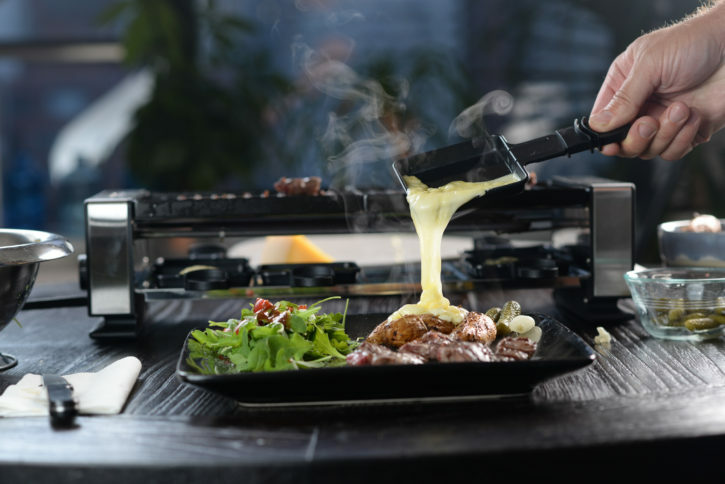 Raclette is a one dish meal so plan your cheese quantity in consequence and depending on your family and friends appetite! You can put all the ingredients on the table and everybody does what he wants! Just enjoy and have fun with your host! We have friends who have Raclettes and have had Raclette Parties. We decided to dive in and get our own. We have had several meals on this and find the flat surface to be the best. It’s a great tool to have family conversation and get the family involved with the cooking. We made pancakes and bacon on it for a family breakfast and had a great time. Lots of possibilities with this. I picked this one because of the good reviews and am happy with the results. Put it in the center of the table on a wooden cutting board for example so you are sure to protect your table. On the top there is a cooking surface where you could put boiled potatoes to keep them warm, but be careful they could burn so if I were you I would check them regularly. You could also have bacon grilling or very thin slices of duck breast to cook with onion rings, mushrooms, scallions, pepperoni etc… just put a LITTLE bit of olive oil on the top grill before cooking even if it is a non stick material.